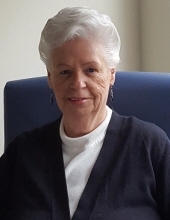 BEVERLY – Beverly Ann (Abbott) LeBel, 83, beloved wife of the late Robert L. LeBel, passed away peacefully at her home surrounded by her family, on April 9th. Born in Nashua, New Hampshire, on February 4th, 1936, she was the daughter of the late Gordon Leroy Abbott and Beatrice Flossie (Davis) Abbott, both of Vermont. Beverly was raised from the young age of 8 at the Daniel Webster Home for Children along with her 6 siblings. She then went on to attended Mt. Ida College, where she studied secretarial skills. She met her husband of 23 years (deceased in 1983) through a mutual friend, sparks flew and the rest is history. Beverly has been a longtime resident of Beverly, MA. She was employed for 25 years at Friendly’s Ice Cream, where she worked with her Dear friend Kay Doyle. She loved boating with her husband and daughters, and actually lived on the boat in the summer. Her pastimes were reading and spending time with her granddaughters. She was a loving and caring person and will be greatly missed by all who knew her. She is survived by her sister, Kay Lauze of Bow, NH; her brother, Robert Abbott and his wife Ethel, of Franklin NH, her brother, Richard Abbott of Lowell, MA and her sister-in-law, Sally Abbott; three daughters, Robin Campbell and her husband Vernon of Beverly, Jill Quinn of Beverly and Kim LeBel & longtime Love, Ryan Pittman of Peabody; three granddaughters: Kayla Quinn and her Fiancé Shawn Smith of Beverly MA, Anna Quinn and her Fiancé Jordan Krull of Lexington, NC and Lilah Quinn of Beverly MA. As well as, several nieces and nephews. She is predeceased by her brothers, John Abbott, Frank Abbott and Donald Abbott and her sister Dolly Abbott. To send flowers or a remembrance gift to the family of Beverly Ann LeBel, please visit our Tribute Store. "Email Address" would like to share the life celebration of Beverly Ann LeBel. Click on the "link" to go to share a favorite memory or leave a condolence message for the family.